I think the plan is to make Jack part of the franchise, with father and son busting bad guys together but there might not BE a franchise after this movie. The problem isn’t Courtney or Bruce Willis, who is still in fine form. It’s the story and dialogue which are beyond STOOPID. Insulting even. They could have used Charlie Brown’s teacher instead of dialogue and it would’ve been as good. Despite this, I enjoyed myself. It might have been the bourbon my movie date smuggled in, but I wasn’t the only one laughing & cheering through some of the more ridiculous scenes. You simply don’t go see a Die Hard movie expecting a credible story or interesting dialogue. You go to watch Bruce Willis blow s#*% up and you get that in spades, so I’m giving “A Good Day to Die Hard” a C-. 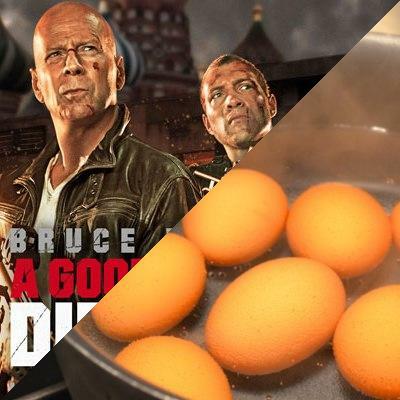 So, hard-boiled eggs doesn’t seem like it’s all that… hard. But we have recently discovered the hands down, best way to make PERFECT hard-boiled eggs. Whether it’s for an egg salad sandwich, deviled eggs or alone as a snack, this technique is foolproof and also cuts down on the sulfur smell and green ring that shows up around the yolk sometimes. Start by taking 6 eggs, and placing them in a single layer in a saucepan and fill with cold water until eggs are covered by 1 inch. Place pan over high heat and bring to a boil. As soon as water boils, remove from heat and cover for exactly 10 minutes. Meanwhile, fill a large bowl with ice water and set aside. After 10 minutes, drain the water from the saucepan with the eggs, and shake the pan to crack the shells. Then place in ice bath to stop the cooking process. By cracking the shells before the ice bath the water gets between the yolk and the shell and will streamline the peeling process. Another great trick is when making deviled eggs, store the carton of eggs on it’s side in the refrigerator the night before. This will help to center all the yolks before cooking, thus giving you perfectly uniform deviled eggs. Speaking of, try these on for size: deviled eggs with smoked salmon.